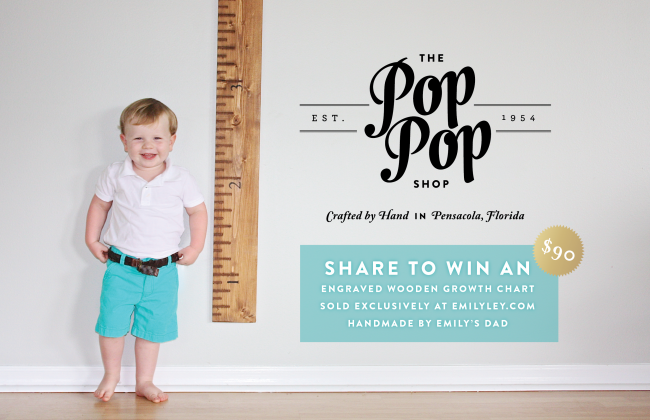 Win a wooden growth chart from The Pop Pop Shop! This photo is so cute I can’t even stand it! And YES, I bribed him with a miniature ice cream sandwich to get him to stand still. And YES, I’m working on a weekend but only because it’s for one of the greatest people on the planet. My dad. Happy Father’s Day, Dad! My Dad always taught me that I could be ANYTHING I wanted to be. Anything. Even a crazy graphic designer, product creator, brand developer, stay at home Mom, caffeine addict. (Thanks, Dad!) When he started dreaming up ideas for creating and selling the wooden treasures we’ve always had around our home (and my own home now that I have my own family), I was so excited to help. Now, I’m SO EXCITED to announce that he’s offered to GIVE AWAY one handmade wooden growth chart to one of you (US only)! And guys, these aren’t just your typical “wooden rulers to hang on the wall,” each inch and foot mark is actually routed into the wood and the numbers are carefully stenciled by hand. Gorgeous. Share the photo above on Instagram and tag @EmilyLey and #YAYPOPPOP. Share the photo above on Pinterest and link to The Pop Pop Shop. Share the photo above on Twitter and tag @EmilyLey and #YAYPOPPOP. Hooray! Comment below to let us know how you’ve entered! Giveaway ends on July 1 at midnight EST. Ready… set… go!